For the city in Washington, see Vancouver, Washington. Vancouver is a coastal city and major seaport on the mainland of southwestern British Columbia, Canada. The city has a population of over 630,000 and is the largest city in British Columbia. 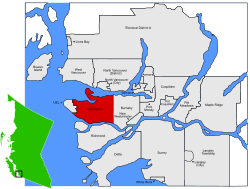 Metro Vancouver has a population of over 2 million people. That makes it the third largest metropolitan area in Canada. Vancouver has a mix of people from different cultures. Fifty-two percent of city residents have a first language that is not English. "By Sea, Land, and Air We Prosper"
Native People began living in this area around 10,000-8,000 years ago. These people were part of three main groups: the Squamish, Musqueam, and Tsleil-Waututh. Vancouver was founded in 1886, and is named after British naval captain George Vancouver. Captain Vancouver explored the area around Vancouver and Vancouver Island in the 1790s. The University of British Columbia is in Vancouver. Vancouver also has Stanley Park which has beaches and totem poles. Nearby is Grouse Mountain which has good skiing and has a 2.9 km (1.8 mi.) hiking trail which is known as the Grouse Grind. Grouse Mountain also has an animal sanctuary, including wolves and bears. The Lions Gate Bridge is in Vancouver. Vancouver has two ice hockey teams, the Vancouver Canucks (who play for the National Hockey League) and the Vancouver Giants (who play for the Western Hockey League). The BC Lions of the Canadian Football League are based in Vancouver. The team has won 6 Grey Cups. In soccer, Vancouver is home to the Vancouver Whitecaps FC. The 2010 Winter Olympics were held in Vancouver and it was the first time Canada won a gold medal on Canadian soil. 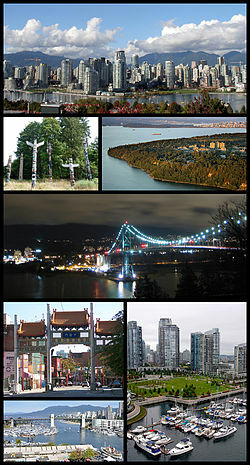 Vancouver is on a peninsula on the West Coast of Canada, less than a one-hour drive north of the Canada-U.S. border. 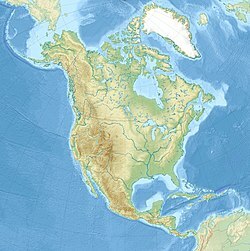 Between Vancouver and the Pacific Ocean to the west is a large island called Vancouver Island. Until the city was named in 1885, "Vancouver" referred to Vancouver Island. Some people mistakenly think that the city is on Vancouver Island. On the south shore of Vancouver is the Fraser River, which flows west into the Strait of Georgia. The water along the north shore is called Burrard Inlet. The city has an area of 114 square kilometres (44 sq mi). The larger metropolitan area is 2,878 square kilometres (1,111 sq mi). 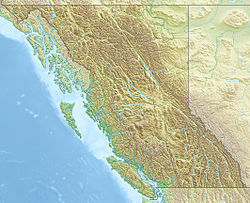 As with most of British Columbia, Vancouver is in the Pacific Time Zone (UTC−8). Vancouver has a warm-summer Mediterranean climate (Csb in the Köppen climate classification). The average annual rainfall is 1155 mm, mostly from October to April. High temperatures in the summer average 22 °C. The highest temperature ever recorded was 34.4 °C on July 30, 2009. On average, snow falls on only 11 days per year. The snow is usually wet, not very deep, and melts in the rain. On average, on only 4.5 days a year does the temperature not rise above freezing. Data recorded at Vancouver International Airport by Environment Canada. Data spans 1971 to 2000. The government has been attempting to address the housing crisis situation by imposing a series of taxes such as the Foreign-buyers tax and Empty Homes Tax in 2016 and Speculation tax in 2018. ↑ "Population size and growth in Canada: Key results from the 2016 Census". Statistics Canada. May 10, 2016. Retrieved February 8, 2016. ↑ 4.0 4.1 "Global city GDP 2014". Brookings Institution. Archived from the original on June 4, 2013. Retrieved November 18, 2014. ↑ "Province of British Columbia and Greater Vancouver Transit Authority (TransLink) Facts 2008" (PDF). Government of Canada. Retrieved 2007-12-01. ↑ "2006 Census: Population by mother tongue - cities". Retrieved 2007-12-17. ↑ "City Facts 2004" (PDF). City of Vancouver. Retrieved 2006-11-11. ↑ Thom, Brian (1996). "Stó:lo Culture - Ideas of Prehistory and Changing Cultural Relationships to the Land and Environment". Retrieved 2006-11-23.